Hackers had a banner year in 2014. They stole hundreds of millions of passwords and other pieces of confidential information from banks, retailers, credit card companies, even film company Sony Pictures. A record number of computer breaches affected more than half of all American adults, costing businesses up to $500 billion, and fueling increased attention to the security of Internet interactions. But the financial consequences of those attacks pale in comparison to the possibility of intrusion and disruption of the electric power system. From hospitals’ life support machines to nuclear reactors to home heating during bitter cold winters, keeping the power flowing can be a matter of survival. Increasingly the power grid is a smart one, an interconnected system of electric power generation, distribution, advanced home meters and appliances, and computer control centers. The system can increase efficiency, reduce outages, and possibly lower costs. But with more and faster communication across the system comes greater vulnerability. At Washington State University, a combination of power engineers, computer scientists, and their industry partners simulate holes and weaknesses in the smart grid, then work out ways to manage the risk of hackers interrupting and subverting the electric power system. Their key to successfully securing the grid is understanding that the threats are both cyber and physical. Liu says a successful attack could cause not just a power outage, but create a tremendous expense for utilities as they replace blown transformers worth millions of dollars each. The threat is not just theoretical; in 2007, Idaho National Laboratory ran an experiment where a cyber attack physically destroyed its Aurora Generator, causing it to explode after rapidly opening and closing circuits. Even President Barack Obama and Congress agree that cybersecurity is a national priority. “No foreign nation, no hacker, should be able to shut down our networks, steal our trade secrets, or invade the privacy of American families,” said Obama in his 2015 State of the Union, to rare bipartisan applause. To keep the smart grid operating, it must be resilient when things go wrong, says ESIC Director Chen-Ching Liu. One tool to help recover from electric power system failure is a microgrid. A microgrid connects onsite electric power generation—such as WSU’s backup generators—to the local power grid. The smart grid can then use excess power from the backup source in case of disasters or outages. Hurricane Sandy focused attention on the resiliency problem when many New York and New Jersey coastal towns lost power for days. Since ESIC is an integral part of the $178 million, Department of Energy-funded Pacific Northwest Smart Grid Demonstration Project, WSU researchers and their partners have worked on better ways to increase resiliency, such as microgrids. A military base, shopping mall, or industrial park can be a microgrid. In the case of Pullman, power utility Avista installed a state-of-the-art battery storage system, the largest of its kind in North America and Europe that is connected to the grid. Washington Gov. Jay Inslee, U.S. Sen. Maria Cantwell, and U.S. Rep. Cathy McMorris Rodgers attended WSU’s inaugural energy summit this spring to introduce the new battery, which is housed at SEL. The giant battery will give researchers insight into how power from renewable sources can be stockpiled, another major element of microgrids and smart grids. In the electric power transmission control room at WSU’s engineering building, a hacker attacks the power grid. It’s a smart grid, shown on large computer monitors as yellow squares and lines representing electric substations and generators, and at first everything is copacetic. A moving graph shows a steady flow of electricity that keep refrigerators running and iPhones charging. Then a square starts to blink red. A circuit has been forced open and a generator disrupted. Within seconds, the red blinking spreads from one square to another, the graph line descends in jagged increments as voltage goes down, and soon the entire grid has cascaded into a complete blackout. Fortunately the attack is a simulation, run by Liu’s graduate student as the hacker. Another graduate student operates the control system. In a second demonstration, they use an anomaly detector within the smart grid’s substations, which first identifies signals that aren’t trustworthy, then isolates them to prevent further damage. This time the attack does not bring down the power grid. Liu explains that their software looks at computer traffic and spots oddities. “When you find unusual things, you try to figure out what to do with that. Hopefully you kick out the intruder early enough that there’s no impact on the grid,” he says. Smart meters, which send usage information to the Avista utility to increase efficiency, are part of the project in Pullman. On the consumer side, Liu recognizes the need for diligence on privacy issues for the devices, since around 60 million smart meters are expected to be deployed around the United States by 2019. There’s a strong interest in securing smart meters because unauthorized access could not only lead to infiltration of the power grid, but a criminal might see that no one is home if there’s less electricity use, says Liu. Because of privacy and other societal and policy implications of the smart grid and cybersecurity, Liu brought WSU psychologists, sociologists, economists, and political scientists into the ESIC group. They work in concert with the engineers to address privacy and other human factors connected to electric power systems. Liu also headed up smart grid implementation for the European Union before coming to WSU, which shared many of the same concerns. Up a couple of floors from the smart city control test bed, electrical engineer Anurag Srivastava leads the team in another smart grid demonstration and research lab, where stacks of electric relays, sensors, and controllers connect to real-time simulators. This is the physical side of the system, connected to its own smart grid simulation and acting as a complement to the smart city test bed. The sensor helps in monitoring the simulated power grid using the same hardware as a substation, says assistant professor Srivastava. He explains that this WSU test bed emulates the way data flow from real equipment to control centers, and how different actions such as cyber attacks may impact the physical system. It also helps in analyzing advanced communication technologies in a smart grid. “In the past, you used to get snapshots of the grid, like a picture which would come every four seconds. Now you’re looking at more like a video of the grid with fast sensors,” he says. That immediacy means more control ability to isolate problems and maneuverability to bring back the power system in case of trouble. Srivastava says the test bed can help analyze responses to both hackers and damage from storms, accidents, or direct physical attacks by humans. “A big concern is how to survive big storms like Hurricane Sandy. Turns out some of the techniques you need to survive cyber attacks are the same kinds of technology and processes,” says Bose. On the other side of Pullman, Dave Whitehead ’89, vice president of research for the electric power equipment manufacturer Schweitzer Engineering Laboratories, or SEL, takes an engineer’s perspective on cybersecurity. “We build systems to take into account temperature and other environmental factors. Cybersecurity is just another thing we need to do so we can make sure the system is robust and reliable,” he says. After he graduated from WSU, Whitehead worked on submarines in Connecticut, and then returned to Pullman and the expanding company in 1994. Whitehead says security has always been built right into the company’s electric relays and other equipment. Edmund O. Schweitzer III ’77 PhD started the company in his basement in 1982, with an industry-changing digital protective relay—a device that monitors power lines and systems for problems. Since Schweitzer, also a former WSU faculty member, had introduced the world’s first microprocessor-based relay, he recognized the potential for misuse through the increase in electronic communications. The relay was now passing more information than ever to an electric utility’s control centers through dialup modems. Even in the early 1980s, Schweitzer required two passwords to use the relays, one for technicians to evaluate problems and another for engineers to actually change settings. He says there are advantages to securing the grid, as opposed to guarding strictly online transactions. When it comes to cybersecurity, the challenge for Target or banks is abstract; it is money, but it’s a handful of bytes in a computer, says Whitehead. “When you take the money from my account or give me a whole bunch, there’s no connection to the physical universe. I don’t all of a sudden have a million dollars sitting in my wallet.” For the electric power system, the cyber part really does connect back to some physical thing, whether it’s electrical current or an open circuit breaker. Another advantage is that power systems are overmeasured, “so if somebody were able to spoof one location, we have another location that essentially measures the same thing,” he says. If something is wrong or values don’t match, the attack can be identified and isolated. Adam Hahn, a computer scientist at WSU, says researchers must consider the worst ways to break the power system if they want to mitigate against attacks. “How can you defend against something you don’t know? You have to know what an attack is going to do before you can defend against it,” says Hahn. “In other engineering fields you try to design a system that meets some functional requirements. Here we try to figure out how we can violate whatever assumptions they made. Hahn came to WSU in 2014 after working in the private sector on cybersecurity, primarily for the federal government. He says cybersecurity really came to the forefront after the 2010 revelation of Stuxnet, the powerful computer “worm” that could propagate and infect computers to control machinery and industrial processes. Stuxnet was a magnitude of order worse than anyone imagined, says Hahn. 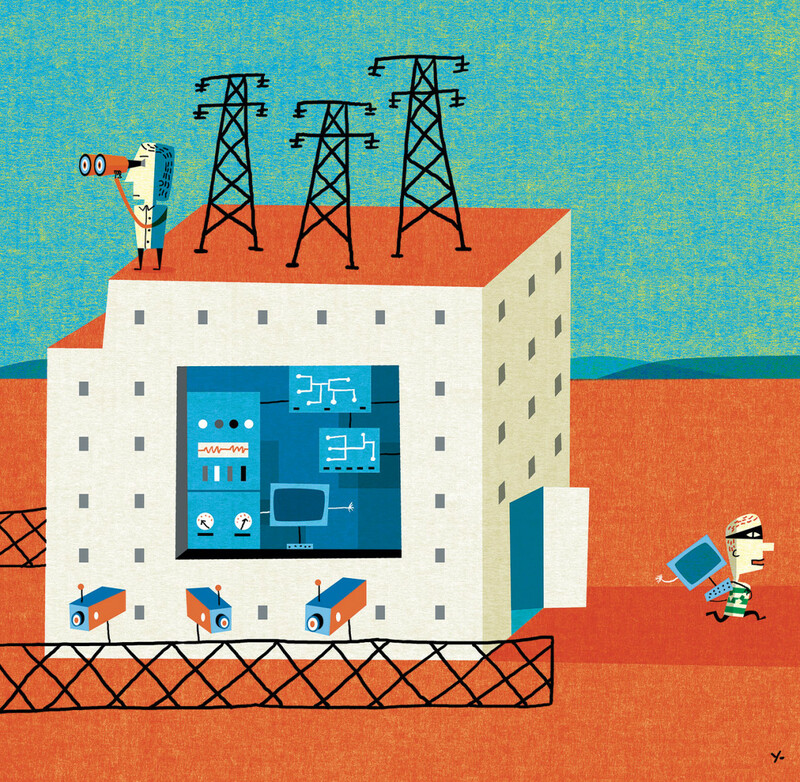 It pushed into high gear the research into cybersecurity of physical systems like the power grid. Hahn and WSU computer scientist Carl Hauser work with students to infuse the security mindset—in effect, to think like a hacker. Hauser says students will often come up with good security ideas, but don’t necessarily think about how their ideas might be circumvented. “Having built this thing, it’s hard for some people to ask, ‘Where are the holes?’ You don’t want to admit there are holes,” says Hauser. They teach the students partly through attack and defense games on the operational systems, called red team-blue team competitions. Hahn isn’t worried that they’re teaching students to be hackers. “You pretend you’re an adversary and attack the system. As a security person that’s what you really need to focus on,” says Hahn. To Hauser, invasion is inevitable. Experience shows us that computer security will be breached, just not very often, he says. When there’s only one line of defense, it reduces planning for the attack that makes it through. “That’s not helpful. It doesn’t lead you to doing the things you should be doing to make the system resilient,” says Hauser. Instead he recommends that people look at computer security as risk management. That makes it easier to talk about how to contain damage in the rare instances when attacks succeed. Hauser has worked with power engineering faculty for over 10 years on how to secure the communications that take place in the power grid and understanding the risks associated with different types of cybersecurity failures. In turn he and the other computer experts learn from engineers about how to build control systems that fail gracefully and rebound after problems, just like the power grid itself. Their collaboration doesn’t end with research. WSU’s graduate students take courses team-taught by the two disciplines, a unique combination that benefits both fields. In many ways, the struggle between good guys and bad never ends. It becomes an arms race over the security of computer systems, and new challenges continue to push engineers. One of the challenges is the growing amount of data and computer traffic. The smart grid, with its numerous advanced meters on homes and businesses and complex control systems, will create a flood of new information. Hahn also points out that, unlike smartphones, home computers, and other short-lived products, power equipment lasts up to 30 years. That makes it tough to build computer security systems that can block out hackers of the future, perhaps even armed with the capabilities of ultrafast quantum computers. Moreover, he says, the “Internet of Things,” with its interconnected devices from refrigerators to light bulbs to smart meters, can exacerbate security concerns when they get picked up quickly by consumers. “We don’t think about the risk before we do the adoption. From a security perspective, we’re always chasing the problem,” says Hahn. Despite these challenges, the WSU engineers and industry researchers realize most people just want the electricity to work. “My expectation when I go home is that I hit that light switch and the lights come on. I think it’s the same for all consumers,” says Whitehead. Protecting power transmission and distribution from hackers or storms keeps the TV on and businesses running. This is something the smart grid can do well, as long as it’s secure. A smart grid, or any computer system, guards against attackers by encrypting its data for communication. Contemporary encryption is designed around complex mathematical number theory, and usually involves RSA, an acronym from the names of its algorithm’s creators, in which the product of two large prime numbers is factored to make an encryption key. With advances in computing power possibly leading to very powerful quantum computers, hackers could carve quickly through existing encryption. Basically, a quantum computer could perform multiple calculations simultaneously, enabling it to unravel the encryption scheme and expose data. One alternative comes from WSU mathematician Nathan Hamlin’s doctoral work with his advisor Bill Webb, an emeritus mathematics professor. They took a math puzzle from the 1800s called the knapsack code and revised it to make it a much harder problem. The original knapsack problem begins with a large number (the knapsack) and small numbers (objects). The trick is to find the right combination of objects to fill the knapsack. It was originally tested as an encryption method in the 1970s, but it was cracked easily. Hamlin and Webb took the knapsack code and introduced complex number systems beyond binary and base 10, creating a math problem which can’t be broken by typical cyberattacks. “There’s no algorithm in quantum computing to solve a difficult knapsack,” says Hamlin. Read more about Hamlin and Webb’s work on the improved knapsack code. 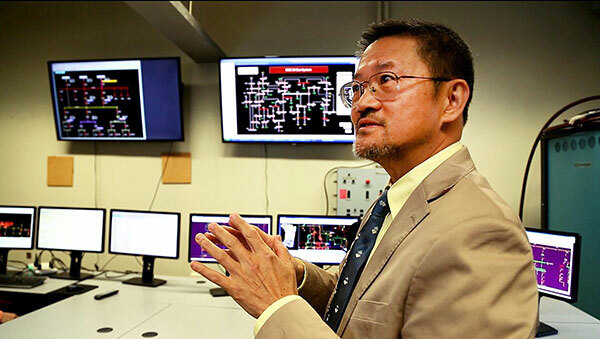 Chen-Ching Liu, Anjan Bose, Adam Hahn, and the other researchers at Washington State University’s Energy Systems Innovation Center explain the smart grid and how to safeguard it from hacking and natural disasters, with redundancy and testing. Watch the videos produced by the WSU Video Team.